Photo: Pleasant Grove, ca. 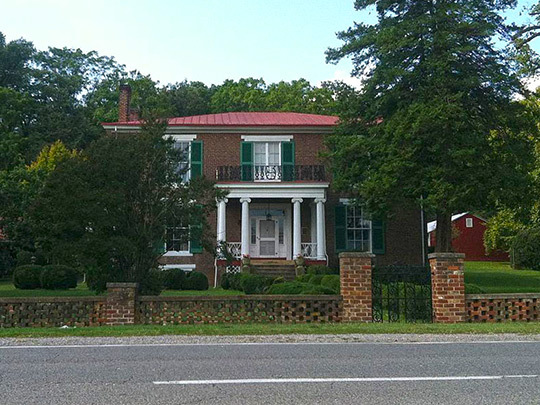 1853, 4377 West Main Street, Salem, VA. Listed on the National Register of Historic Places in 2003. Photographed by User:Molly Cardenas (own work), 2012, [cc-by-3.0 (creativecommons.org/licenses/by/3.0)], via Wikimedia Commons, accessed June, 2014. The Roanoke County Courthouse is located at 305 East Main Street, Salem, VA 24153; phone: 540-387-6205. Salem, an Independent Virginia City, is the seat of government for Roanoke County. Scottish-Irish immigrants began settling in the area as early as 1740. The county was created in 1838 from parts of Botetourt and Montgomery counties.